Of all of the places I have traveled, this place is by far the most disturbing. 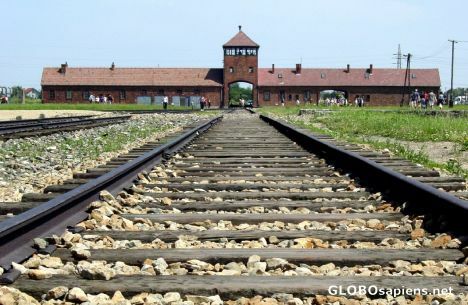 At a distance of 3km from the main camp, in the village of Brzezinka, the camp of Birkenau – KL Auschwitz II – is situated. Covering approximately 425 square acres, it contained over 300 buildings. Of these, 45 made of brick and 22 of wood have survived almost intact. In the places where the other buildings previously stood (these were either burnt down or demolished) only the hearths remain. However, their outlines on the ground are clearly visible, giving us a good idea of their original size and number. Gurney - this evocative photo captures the appalling nature of the place only too well. One of the most known views of this sad place. Emotions there are always very strong. Good picture of the entrance gate. It is always really hard to comment on pictures from here, as it always evokes so many different emotions.